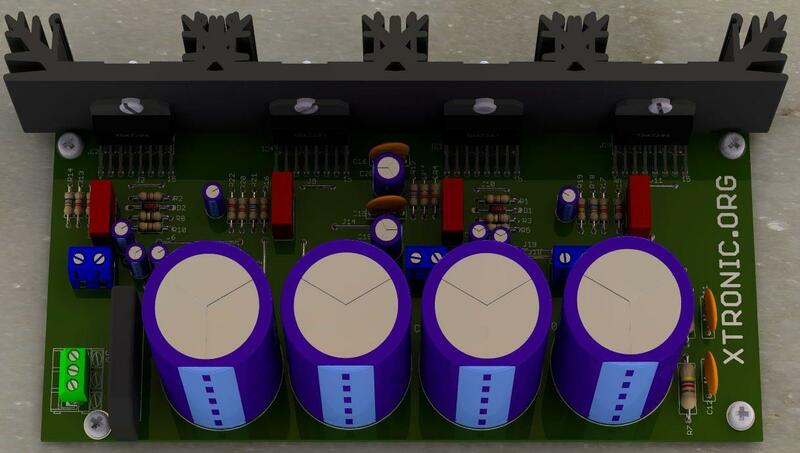 The circuit of the amplifier with TDA7294 was a big hit among our readers, so bring more than this version of the amplifier with TDA 7294 “Brutus,” this is an application bridge to the tda7294 that can provide up to 170 Watts @ 8ohms, 38 VDC. The TDA7294 integrated circuit developed by SGS Thompson (www.st.com), allows you with little money, have a complete amplifier, it is designed as an AB class audio amplifier and is ideal for use in home systems Theater and high quality amplifiers for easy assembly. It is capable of working with 4, 8 and 16 Ohms loads (speakers). It is capable of delivering 100 Watts @ 4 Ohms, VS = + – 29V, 100 Watts @ 8 Ohms, Vs = + – 38V. The total distortion is only 0.1% at PO = 0.1 to 50 Watts and F = 20Hz at 20KHz. In this version of Bridge or Bridge amplifier, keep in mind the impedance of the speakers! 8 Ohms is the minimum recommended is 16 ohms using only voltage up to +-38Volts. 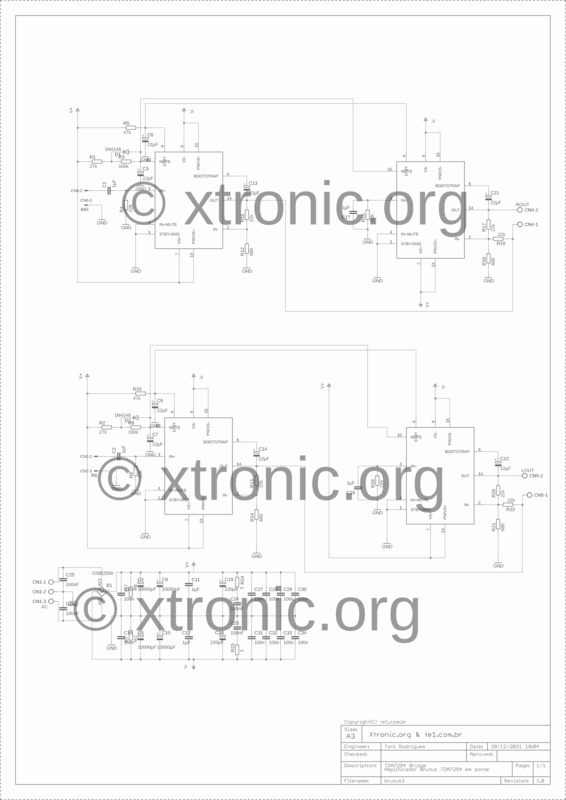 The circuit is divided into two main parts the power supply and the power amplifier. Power supply for Brutus – The power supply is composed of a 18-0-18 to 26-0-26 @ 350VA transformer, The bridge rectifier must be a GSIB2580 or equivalent, the capacitors can be from 4.700μF/50V Up to 10.000μF/50V. There are also 2 ceramic capacitors and 2 resistors, the function of these resistors is to discharge the large electrolytic capacitors, when you turn off the circuit. Power amplifier – The amplifier part is configured to work in stereo bridged stereo, using 4 integrated circuits, resistors R11, R12, R17, R18 (R) and R13, R14, R20, R21 (L) determine the gain of the amplifier. With these components is set to 30 dB. The mute/Stand-by circuit is connected directly to the VCC of the circuit. The input impedance is determined by the resistors R4 and R9. When assembling the integrated circuits in the heatsink, you must use insulated bushings to avoid electrical contact between the metal body of the IC and the heatsink. The printed circuit board suggested for this assembly is single face, to facilitate mainly the life of the beginners … however if it is simple face there comes Jumpers! Connect pieces of wire, interconnecting the dots, paying attention to the thickness of the jumpers at the power connection points. Printed Circuit Board, Welding, Wires, Box, heatsink, etc. Buy Diy kits TDA7294 in Aliexpress with free Shipping in the Worldwide. hi tony my compliments with the brutus project I have now also build him and just wonder if I can get rid of the hum of the diet you have an idea I would like to hear from you if you know a solution for it further am very happy with this project. como seria la configuracion correcta .. ? le prestamos atencion al circuito? o a lo que dejo toni en la lista de componentes ? Hai toni, Resistor R6, R7 4k7 or 47k? Wledon, Tony. please, which software did you use in the design of the board and the 3d realization. I builted brutus amplifier and it doesn’t work correct. Once, I start the amplifier without load, it start increasing the temperature to the ics and bridge rectifier rapidly. nice clearity & bass ! plz give your email id. Toni I would like you to send for me pdf files for this project. Am more interested in building this for my mini PA amplifier. bonjour ne peux ouvrir en pdf merci envoyer dimensions du pcb. the project is very nice and cool, i want to plead that you made a mistake listing the parts, the 22k resistor color code should be Red-Red-Orange not Red-Orange-Orange. once again thanks for this projects….it quality is amazing. and this one R14 to R28 it’s 47K or 4.7K ??? please help me. hello as scan the schematic diagram….the (R6,R7=4.7K 1/2 watt) (R12,R14,R18,R21=680 ohms 1/4 watt) (R5,R10=47K 1/4watt)………….before i will built also this project circuit…… email me at ferrerronaldo300@gmail.com what will be the outcome and result…. C1,2,17,18 : 1µF /250V – Polyester Capacitor. C3,6,7,8,13,14,21,22 : 22µF/50V – Electrolytic capacitor. C4,5,9,10 : 10.000µF/50V – Electrolytic capacitor. C11,12,15,16 : 100nF /100V – Ceramic Capacitor. C19,20 : 220µF /50V – Electrolytic capacitor. B1 : VSIB2580, GSIB2580, D25XB60, GBJ2510. Transformer : 230 V/2×18 V….2×26 V-8A. Silk Screen, PCB, PCB component side, Silk screen, TDA7294 Eagle Library, TDA7294 Datasheet. Would you mind to send me the file Via email ? I’m very interesting in this project,but I cannot download the PDF file in my area.Would you mind to send me the file Via email? could you send me the files please? i am very interesting in this project but i cannot download the PDF file.would you mind to send me the file via e-mail? 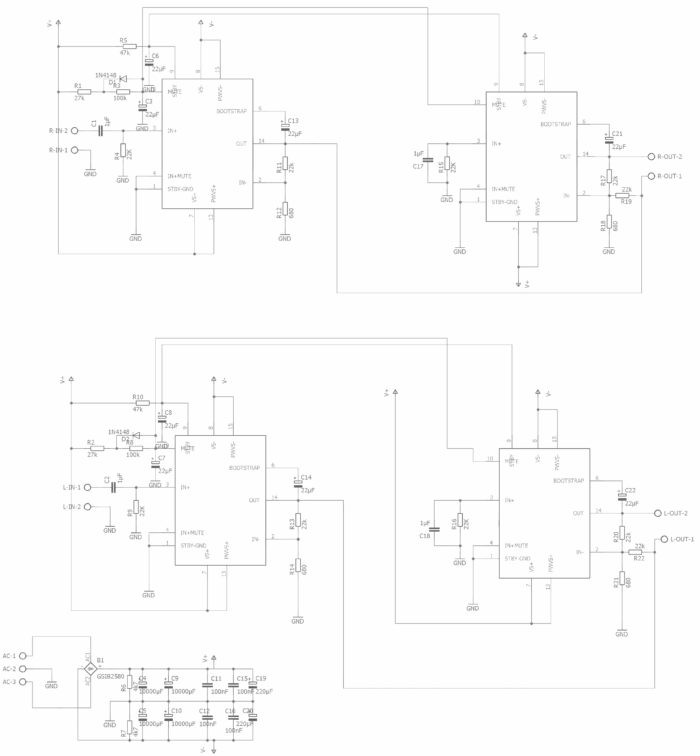 i want TDA7294 Datasheet and pcb width and height size. 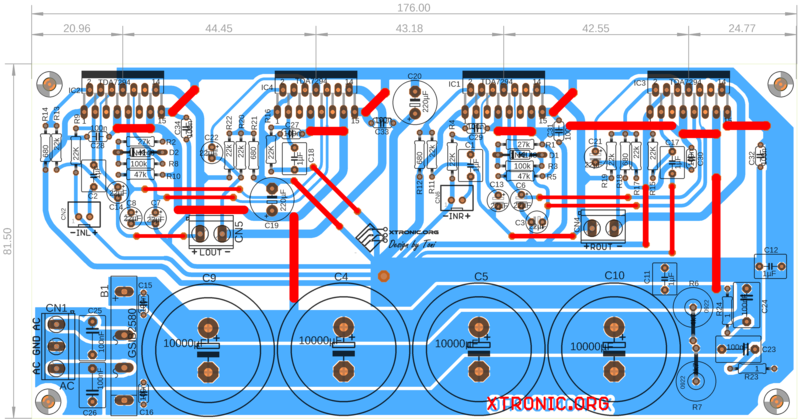 i want tda7294 bridge 2x 170 Watts amplifier pcb Width and Height size. i am not able to download the file, can you send it me over mail? i am not able to down load the file, can you send me the file Via email ? Can we again bridge the two channels left and right for subwoofer application, Please suggest. If so please help me to understand how to bridge the two channels to a single output with total 300+ watts. I’m very interesting in this project,but I cannot download the PDF file in my area(HongKong).Would you mind to send me the file Via email ?